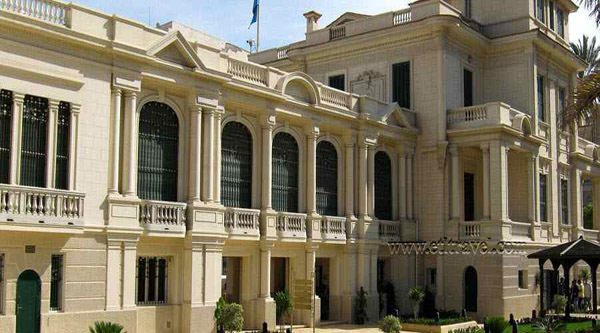 Royal Jewelry museum is located in Alexandria in a Royal palace of Fatma Zahra & hosts a vast collection of Mohammed Ali's family jewelry and personal items. Beside the museum is a great example of Royal palaces in Egypt with original interiors and decoration. Fatma Zahra palace in Alexandria. Royal crown on display at the Royal Jewelry museum. Royal medals from the Royal Jewelry museum. Royal bathroom of the palace. Facade of the Fatma Zahra palace in Alexandria. Royal diadem on display at Royal Jewelry museum. Royal Jewelry Museum in Alexandria. 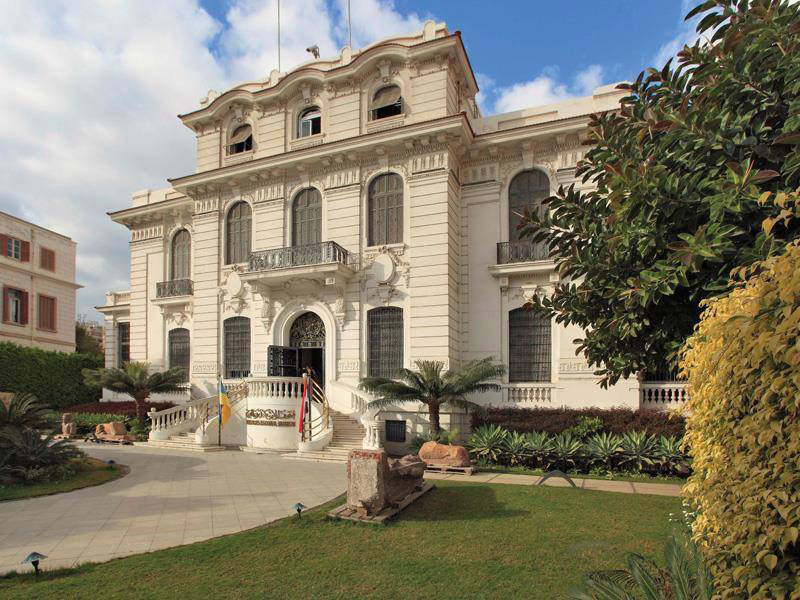 In the elegant Alexandria district of Zizinya stands the Royal Jewellery Museum, its exquisite neoclassical architecture relating an important segment of Egypt's history. The museum is housed in a sumptuous building originally built as a summer palace for the family of Zeinab Fahmi, wife of a descendant of Mohamed Ali. On her death Fahmi left the palace to her daughter princess Fatemah Al-Zahraa, who added an east wing to it connected to the rest of the building by a corridor. Her maternal uncle, an Italian architect who also designed the Sidi Gaber train station in Alexandria, created the interior design of the palace. Construction of the palace began in 1919 and finished in 1923. Total aria of the palace with its gardens was 4185 square meters. This palace represents an exotic style of European architecture and art. The palace consists of 2 wings: Eastern and Western. In the Eastern wing there are 4 qa'as (rooms, recreation halls) and a hall. This wing was built after western one. Two wings were linked together by a corridor with windows on each side. As for the western wing, it consists of 2 floors. On the 1st floor we find 4 qa'as, reception and a bathroom. On the 2nd floor 4 qa'as with attached bathrooms and a hall in the middle, 3 bedrooms. Also on this floor a kitchen, bathroom and 3 rooms for the servants were situated. The building itself as well as decorations inside the palace are masterpieces, they represent Byzantine style. There are a lot of paintings on the ceilings of qa'as' which revile Italian Renaissance. The windows in the corridor between these two wings (great masterpieces) are made of coloured glass (stained glass) with .... All sides of the palaces are decorated with drawings, with different kinds of barrocco and rococo designs. Following the 1952 Revolution, the palace was expropriated by the government, though Al-Zahraa was allowed to live in it during her lifetime. In 1964, she left Alexandria and handed the palace to the government. When she died in 1983 the palace was used briefly as a presidential rest house, and then in 1986 toppled former president Hosni Mubarak issued a decree assigning it as a new museum for the former royal jewellery collection. The building was reorganised such that it could become a fitting home for the jewellery of the Mohamed Ali family, Egypt's former royal house. In 1994 and then again in 2005 the museum was subjected to restoration as time had taken its toll on the building. The building itself was given a face lift and the walls polished. In October 2010, the museum was reopened to the public. However, it was then closed in 2013 as a result of the disturbances taking place across the country in the aftermath of the 30 June Revolution. Other jewels of the Mohamed Ali family, locked for six decades in the Central Bank of Egypt, are now to join the museum's collections. Many of the jewels had been found by chance during a routine inventory at the Central Bank. They were found inside 45 wooden crates that had lain forgotten in the bank's vaults following their arrival after the 1952 Revolution. Among the new items are silver chandeliers, sets of silvers tableware, plates and rings. The museum includes some 11,500 artifacts that were once the personal possessions and gifts belonging to the family and descendants of Mohamed Ali. Among them are magnificent pieces owned by Mohamed Ali himself and his son Said Pasha, as well as by members of the family up to King Fouad and his first wife princess Shuvekar. King Farouk's mother, Queen Nazli, and his wife, Queen Farida, also owned valuable pieces that are now in the museum, some of it designed and created by the French firm Boucheron. The collection includes a luxury chess set owned by Mohamed Ali, a coffee set inlaid with silver and embellished with gold, a set of gold glassware decorated with 977 diamonds and a number of medals and decorations. Gold cosmetics boxes and other items engraved with the initials of queen Nazli are also among the jewels created by the French house of Van Cleef and Arpels. Other notable pieces include a set of jewels owned by the sisters of King Farouk, princess Fawzia, first wife of Reza Pahlavi, the former shah of Iran, and Princess Fayza. There is an Indian-inspired set originally owned by Queen Nariman, the second wife of Farouk. Jewels belonging to Princess Samiha and Princess Qadriya Hussein Kamel are also on show, as are medallions worn by Prince Youssef Kamal and Prince Mohamed Ali Tawfik.